Creating High Quality Projects Since 3 April 2018. We create high quality projects, games, art and more. We are currently looking for members, so look below on how to apply. Artists design and find assets. Sound members find and create sounds for projects. Marketing and Promotional members promote and advertise projects (through advertising studios, forums and more). Moderators reply to comments and keep forum posts and studios clean. Join the team today. Be a part of professional project development and help us create quality projects. 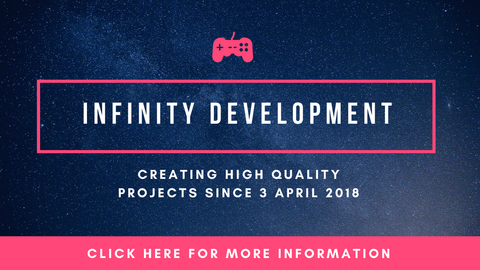 Want an Official Infinity Development Signature? Note: If you are a member, you can use the official MEMBER signature! Check the team chat or ask INFIN1TY for details. The signature is for members only. To make the whole image show, this code MUST be on the top line of your signature with nothing above it. This signature is available for everyone to use. Well you'll have to wait until you a ‘Scratcher’. Then sign an application. Scroll up for it! How do you apply for vice CEO? !! JOIN SCRATCH'S GOT TALENT !! You can’t apply, I have to promote you. I will start promoting people when we start creating projects. I gave you an internet…What is an internet?